Michael Knopp, Executive Director of Oklahoma City Boathouse Foundation, will be our speaker in November. 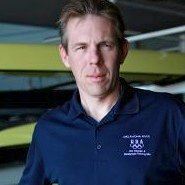 As executive director of the Oklahoma City Boathouse Foundation since 2005, Michael has seen a vision come to life as people of all ages and from all parts of the city have become involved in rowing, kayaking, whitewater rafting, dragon boating, adventure sports, running and cycling at the Oklahoma River. The Oklahoma City Boathouse Foundation’s mission is to develop and operate facilities and programs to improve the quality of life in Oklahoma City, pursue the highest goals of sports and fitness, attract diverse involvement in the boathouses and related events that generate a positive public image and economic opportunity, and promote the use and development of the Oklahoma River as a world-class urban aquatic venue.